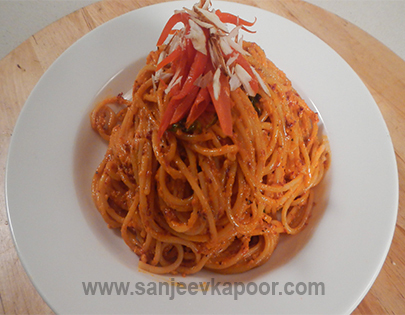 Roasted pepper adds a wonderful smoky flavour to this spaghetti dish. Rub bell pepper generously with olive oil and roast on open flame till charred. Rub red chillies and garlic cloves with olive oil and roast in oven at 180ºC for 5-8 minutes. Scrape off the charred skin of bell pepper and wash gently. Deseed, roughly tear and place in a blander jar along with roasted chillies and garlic and almonds and blend. Add ¼ cup olive oil and blend into a coarse paste. Heat a non-stick pan. Add prepared paste and sauté well. Add coconut milk, stir to mix and cook for a minute. Add spaghetti and toss. Add salt, Parmesan cheese powder and crushed peppercorns and mix. Roughly chop basil leaves and add. Mix well and let it get heated through. Serve hot garnished with roasted pepper juliennes and almond slivers.